Altman’s Cooling & Heating delivers cool comfort to your home or business all year-round, providing the highest quality air conditioners and air conditioning services in Titusville, Cocoa, and the surrounding Brevard County, Florida communities. 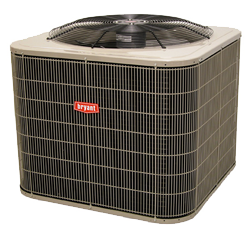 Altman’s Cooling & Heating is proud to be an Authorized Bryant® air conditioning dealer. For over 100 years, Bryant® has provided products customers can rely on Altman’s Heating and Cooling provides professional, quality installation of these great products. We can answer all your questions and help you choose a new air conditioner that fits your home and budget. Once you choose your new air conditioner, we provide expert installation to help you keep cool even on record hot days. Thanks to technology, air conditioners have become more effective and more efficient than ever before. Having an old outdated air conditioning unit can be as uncomfortable on hot days as having no air conditioning at all. An older, less efficient air conditioner can also be a drain on your utility budget. A new air conditioner provides efficient cooling throughout your home, especially if you are installing the unit for the first time. We have a variety of high-efficiency units available to efficiently cool your entire home and help you save money on your energy bill. Improper installation of a new air conditioner is just as bad as not having air conditioning at all. Air conditioners require professional installation to ensure that it is functioning properly and providing the cooling and energy savings you expect. Altman’s Heating & Cooling is an Authorized Bryant® dealer, which means all of our technicians and installers are highly trained which provides you with the highest installation standards and 100% satisfaction with the final product. Every installation is done to manufacturer’s specification to be sure your new air conditioner goes beyond your expectations. The cost of air conditioning installation in Titusville, FL depends on the type and size of cooling equipment you choose. To find out how much air conditioning your home will cost, we offer free estimates. Contact us today to speak with us about your personal air conditioning needs. Please visit our financing and specials pages for the latest air conditioning deals we have available. We are proud to offer the affordable $29 service call*, with fully equipped vans to solve standard heating and cooling problems on the first visit. We maintain the highest level of customer satisfaction. Contact us and let our expert technicians deliver a prompt, professional, and friendly solution for all your air conditioning needs.